HR education sets you apart from your peers. And why shouldn’t it? You’ve likely invested a significant amount of time and energy into preparing for the certification exam in addition to attending appropriate continuing education opportunities in order to maintain it. So, when SHRM announced that they would be creating their own HR designation middle of last year, it sent a shock wave through the HR community (and for good reason). But HR professionals weren’t the only group impacted. ApplicantPro serves as an HRCI Approved Provider which enables us to present topics that are pre-approved for continuing education through our free Webinars. Naturally, with thousands of attendees benefitting from our presentations since the idea’s conception three years ago, we have a vested interest in the evolution of HR education. We were just as surprised about the announcement as many of our attendees were. The way we see it, there are three central questions buzzing in the minds of fellow SPHRs, PHRs, GPHRs, HRMPs, HRBPs, and the like which are included in the subtitles below, but before we dig too deeply, I’d like to breeze through the different designations: I’ve listed each of the SHRM certifications below in addition to their eligibility requirements. You can find a more detailed account on their site. 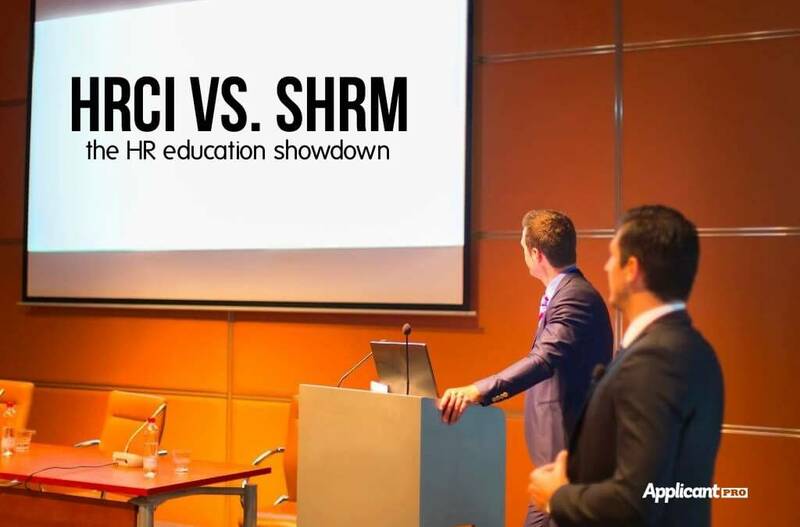 What’s the Difference Between HRCI’s and SHRM’s Programs? This is the most obvious question. If HRCI and SHRM have been working so closely for years, and HRCI has served as the foremost authority in HR education, then why the change? According to SHRM, their primary focus is to extend beyond the knowledge limitations of HRCI, and focus their training on competency to parallel HR’s ever-evolving landscape. Instead of assigning different credit to the various categories (ie Business Management and Strategy vs. General), each topic that fulfills their Body of Competence and Knowledge requirements accounts for Professional Development Credits (PDCs) based on time alone. In other words, one particular area isn’t more important than the other; all learning counts towards accruing the sixty recertification credits needed to maintain your status over the course of a three year period. What Does this Mean for HR Education? If you’re already certified as an HR professional through the HRCI, is SHRM’s designation worth the hassle and the investment? This is a loaded question. Because SHRM is the primary force in HR development and hosts monthly chapter meetings and local annual events, announcing their own certification created quite a stir for fear that they’ll essentially be commandeering all of the HR continuing education space. Currently, for those who are already certified through the HRCI, you simply follow the instructions on their site to nab similar credentials for the next three years. SHRM has also announced that they will continue to honor HRCI’s designations for the 2015 SHRM events, but we can only speculate as to what the plan is after December. It’s worth considering to be certified through both organizations until the HR community can get a firmer grasp on how these changes will shape its evolution. Especially since SHRM events account for the bulk of continuing education. assessment testing including skills tests, job fit, and work values tests. How Will HR be Affected Moving Forward? We’d love to hear others’ opinions on the matter. How has it impacted you? What was your initial reaction to the news? Do you feel like this is a ploy for lining pockets or do you see the value in placing competency at the forefront of continuing education?